Central American migrants, part of a caravan hoping to reach the U.S. border, walk on the shoulder of a road in Frontera Hidalgo, Mexico, Friday, April 12, 2019. 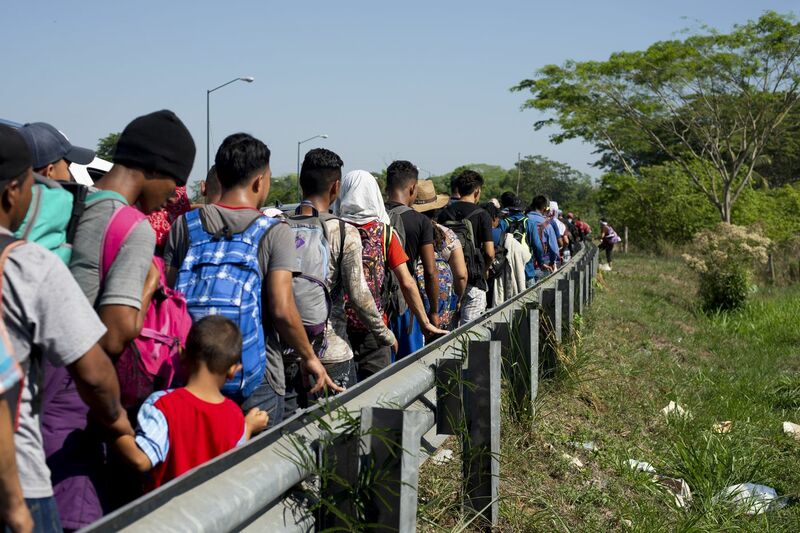 The group pushed past police guarding the bridge and joined a larger group of about 2,000 migrants who are walking toward Tapachula, the latest caravan to enter Mexico. Should President Trump follow through on a proposal to release migrants in U.S. "sanctuary cities," it would be a major departure from the way federal agencies are handling detainees. It could also be prohibitively costly and make it more difficult to deport migrants once they reach those cities. Mayor Joseph Curtatone of Somerville, Massachusetts, which has a population of 81,000, said he would welcome any immigrants the government wants to send his way. U.S. Customs and Border Protection apprehended 103,000 migrants last month — double the number in March 2018 — including nearly 60,000 family members. "Somerville has experienced a continuous wave of immigration now for well over a century of Europeans and those from the Caribbean and Central and South America," he said in a telephone interview. "We speak more than 52 languages in our neighborhoods and our schools. We embrace it." The Washington Post’s Fred Barbash contributed to this report.